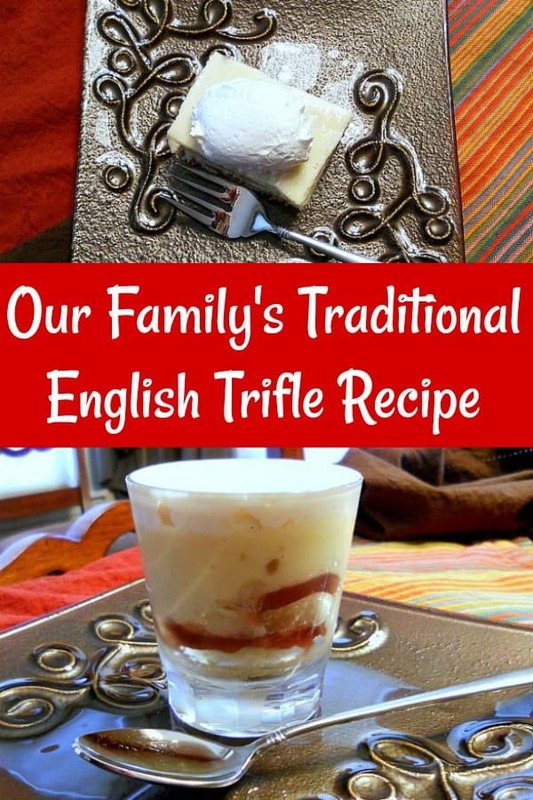 I am so proud to share our family’s traditional trifle recipe with you guys. 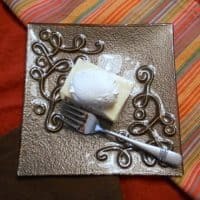 It is one of my favorite desserts, and it’s a must have for Christmas every year. Of course, she would also have also included in the definition a splash or five of sweet dessert wine. In our family, that equals sherry. 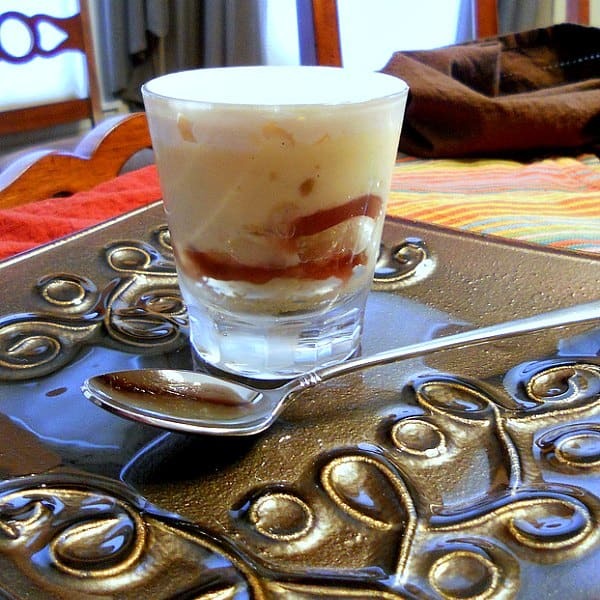 Cream sherry. It’s cheap. It’s sweet. It’s boozy. It reminds me of childhood Christmases. Not that our Christmases were Boozy Bacchanalias where red nosed Friends of the Family forced Christmas cheer down the gullets of toddlers. That sounds like a deleted scene from A Christmas Carol, actually. One that Ebenezer was forced to witness by the commanding bony finger of the scariest spirit of all: The Ghost of Christmas Yet to Come. And that has absolutely no place in our tale, so let’s just move along. We make our trifle in a 9 x 13 Pyrex dish and then cut slices. You can always layer them individually in dishes if you prefer. Rather, Auntie Ev baptized the layers of lemon pound cake in her trifle recipe with a healthy drizzle of cream sherry, the flavor of which goes spectacularly well with all the other elements in this particular trifle. I have eaten other people’s trifles. I’ve read a bunch of different ingredient lists calling for everything from cubed brownies to mandarin orange slices to kiwi to strawberries to Jell-o all bound by boxed pudding. But this trifle, Auntie Ev’s trifle, is really the only trifle you need get to know. I’m serious. The ingredients are simple and few, but the dessert itself is one of my favorite non-chocolate combinations ever. While lots of trifles are Constructed of many repeating layers in tall, straight-sided, footed trifle bowls and are served by scooping out a portion and serving it in a bowl, Auntie Ev’s trifle is traditionally constructed in a rather unassuming 9″x13″ Pyrex baking dish. There is no layer-jumbling scooping that occurs. Nope. Auntie Ev’s trifle is slice-able and gets served in perfectly square pieces with a maraschino cherry plopped right on top of the whipped cream. I have no idea whether this was Auntie Ev’s refinement or if that’s the way her mom made it before her, but it does look lovely on a plate, much more so than a big old scoop of multilayer-ed trifle that gets dumped in a bowl. I don’t use the cherry anymore, but you can add them if you want! Auntie Ev used to make her lemon pound cake for trifle, but the cake you choose to use is up to you. Make your favorite or try a simple version of Van Halen pound cake. A frozen pound cake will even do. 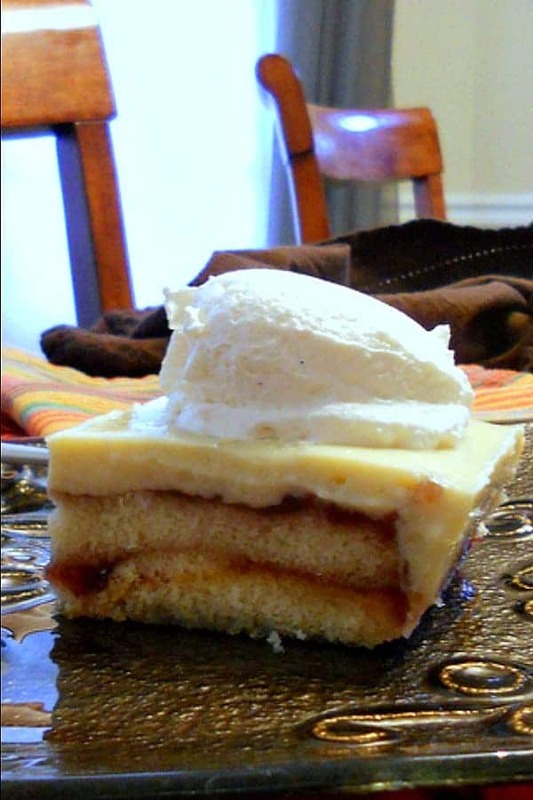 I’ve made great versions of Auntie Ev’s trifle recipe with Sara Lee pound cake. The sherry saves it. Let’s make some trifle, shall we? If this recipe sounds great to you, please rate it/and or comment. I love hearing from readers! There is no rule that says you can't make these in individual glasses. I did this year along with a small-ish 7"x11" Pyrex baking dish. The custard is just my good old reliable scale-able vanilla pudding made extra silky by leaving out the butter. I would hold off making the custard until you have the rest of the layers constructed. Place the vanilla in a large bowl. Set a fine mesh strainer over the top and set aside. In a large sauce pan, combine the milk, corn starch, yolks, sugar and salt. Over medium to medium-high heat, bring this to a boil, whisking constantly. Before it gets too hot, give it a taste and see if you need to add a bit more sugar and/or salt for your taste. Once the custard comes to a boil, turn the heat down to medium-low and cook another 30-45 seconds. Continue to whisk madly. Remove the pan from the heat and strain the custard into the bowl with the vanilla. You may need to use your spatula to force it all through. Stir the custard and vanilla together thoroughly. Cut rectangles of pound cake about 1/2" thick and fit them in the bottom of a 9"x13" glass baking dish. It's okay to leave a little space between the slices at the edges of the pan, but the rest of the slices should pretty much be touching. Even drizzle as much or as little sherry over the layers as you like. This is entirely dependent on who you're feeding, so use your good judgement. I usually use about 1/4-1/3 cup per layer. I don't measure either. I just stick my thumb over the mouth of the bottle and shake on as much as seems Prudent. Evenly spread on a layer of raspberry jam about 1/8"-3/16" thick. Spread on another layer of jam. Pour the custard evenly over the top of the trifle, making sure that it runs down into any gaps between the cake and the sides of the pan. I usually stick a knife in in a few places to allow the custard to spread. You want about a 1/2" layer of custard, so if you seem to have a bit extra, save it for yourself and don't tell anyone. You should still have about 1/2" of space between the top of the custard and the top of the pan. 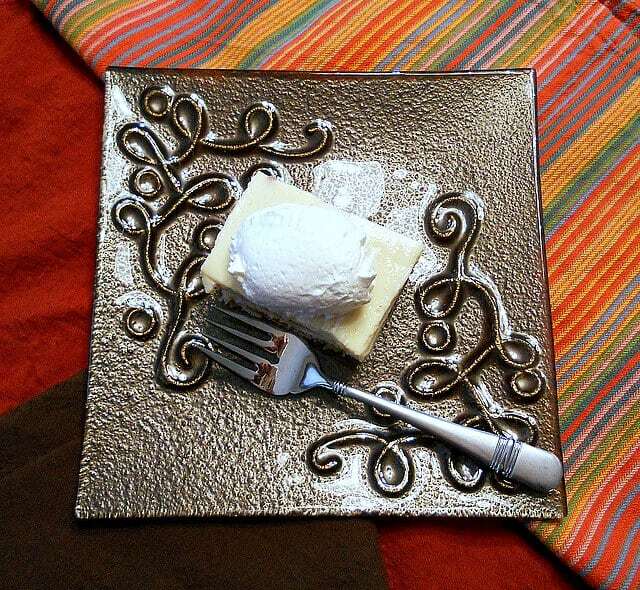 This is where you'll spread your whipped cream. Cover the trifle with plastic wrap (don't worry about pressing it to the surface of the custard) and chill thoroughly. Once chilled, spread the whipped cream evenly over the top of the trifle. Serve in whatever size slices you'd like, and place a completely optional maraschino cherry in the very center of each slice before serving. I even served a version of this trifle at the restaurant. For that, we used lemon sponge cake, a sherry soaking syrup, house-made raspberry jam, vanilla pastry cream and whipped creme fraiche. I served it with a lemon sabayon and a raspberry coulis. It was rather a hit. But even all gussied up, at its heart, it was always Auntie Ev’s trifle. And I think that’s what makes it taste so good. Thank you so much for reading, and if I don’t see you again before Thanksgiving, I wish you the very best and tons for which to be thankful. The recipes that come from those we love are, truly, the most special. 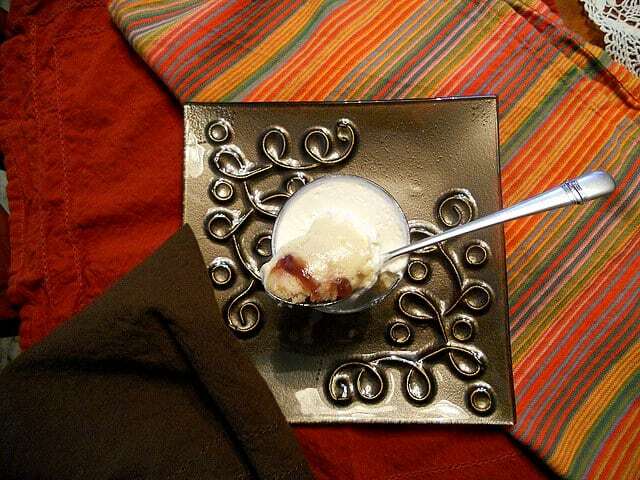 Aunt Ev would be beaming from your words, gorgeous pics and recipe! This version of a trifle sounds very interesting. 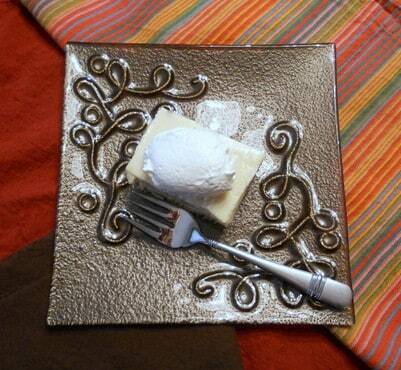 Do you happen to know how many frozen poundcakes ( sara lee ) I’d need to cover the 9X13 dish? I guess I can figure it out but thought you might know already. Hi Joan. Very good question. When I use Sara Lee, I buy two family-sized cakes. It usually takes about 1 1/4. At a guess, I’d say you’ll be okay with 2 regular-sized ones although I like to err on the side of caution and have extra to dip in sherry, spread with jam and eat myself! =) I do hope you enjoy this trifle. It really is one of my favorite desserts in the world! I usually make individual trifles, but on those occasions when I don’t want to go to such bother this is perfect. The big straight-sided trifle bowl looks so pretty until the first couple servings are taken out, then it looks a mess! Exactly! How can something so delicious and so beautiful end up looking like a train wreck after one or two servings?! 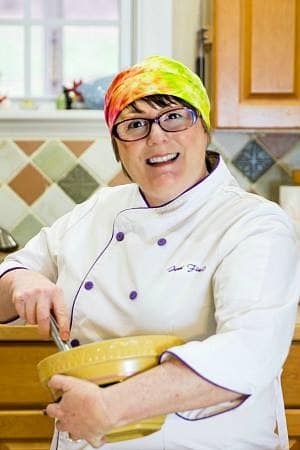 Feel free to adopt Auntie Ev’s layered approach with your favorite trifle, or try our family’s. It really is my favorite!